The VDV II Series are easy to use cable testers that check the integrity of copper cables commonly found in domestic, commercial or industrial voice, data or video installations, including telephone wiring, data network and video/security cabling. 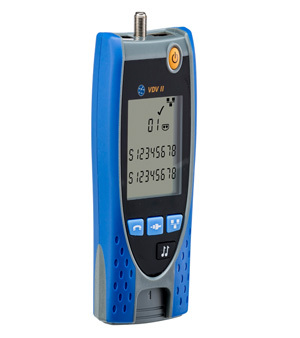 Employing state-of-the-art technology, VDV II offers functionality not previously available in a wiremapper. The advanced wiremap engine accurately displays complex wiring faults instantaneously whilst TDR (Time Domain Reflectometry) aids troubleshooting and improves on-site productivity. Support for 1, 2 or 3-pair RJ11/12 telephone testing cable. Testing of shielded and unshielded Cat 5/5e/6/6a/7 LAN cable. Tests coax cable through F-connector interface.